Making it "usable as a daily device"
Nokia N900 - MeeGo ready? 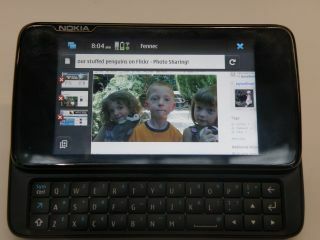 Nokia has officially announced that is working on bringing MeeGo to the N900. An email from Jukka Eklund – the developer edition product manager – to developers, announced that the Finnish phone giant was keen to be as open as possible about the project. "Basically we want to have MeeGo running in N900 device, so that it's really usable as your daily development device," said Eklund. "Basic Handset UX should work, phone calls, SMS, web browsing. So we are concentrating on a few selected features and polish those to be "perfect"," he continues. "It might mean that we leave out some things in MeeGo 1.2 trunk for this edition, but that is not the default intention. "We are doing this fully on the open, and I hope this is an interesting project where we all in the community work towards the same goal: have a great MeeGo edition in the N900. " MeeGo is Nokia's Linux based open-source mobile operating system – although the recent announcement of a partnership with Microsoft has relegated it to a more exploratory role.